The first was great! This one will rock!! A copy of Kung Fu Panda 2 on Blu-ray featuring Dolby True HD surround sound. He had the Kung Fu Panda 2 DVD/Blu Ray for the kids. 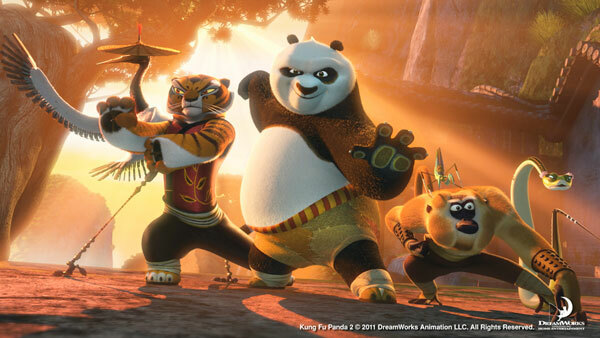 My favorite is Master Shifu, and my kids love Po, of course! He has “Kung Fu Panda 2” on Blu-ray. A Kung Fu Panda 2 Blu-Ray! He had Kung Fu Panda 2 on blu ray! A Blue Ray video of Kung Fu Panda 2. I like Po best, because he looks a lot like me. a new copy of KungFu Panda 2 Blu-ray in true HD. My favorite would be PO. I like Po because he reminds me of ....Me! Giving away a DVD to the kids. Actually Po’s dad is my favorite. Kung Fu Panda 2 on Blu-ray featuring Dolby!!! Tigress is my favorite character! kung fu panda bluray dvd!!! He had a Kung Fu Panda 2 Blu-ray+DVD+Digital Copy of the movie. and my favorite is Po Skadoosh ! His surprise is Kung Fu Panda 2 on Blu ray and DVD! He had Kung Fu Panda 2 blue ray/dvd. My favorite characted is Po. The surprise Mr. Hong has for the children is Kung Fu Panda 2 on Blu-ray with Dolby in true HD! Po is my favorite Kung Fu character. The surprise was Kung Fu Panda 2 DVD in Blu-Ray!